Where do I use my Unineed voucher code? Find a deal you wish to use at Unineed from our selection at NetVoucherCodes. Copy the code if provided then follow the link through to the Unineed homepage. Click on products you wish to buy and click ‘Add to Cart’. Insert your promo code into the box provided beneath your order. Click ‘Apply Coupon’ and ‘Proceed to Checkout’ to complete your purchase. Unineed is the fashion, fragrance and beauty retailer to provide your ultimate one-stop shop for all your cosmetics needs. Providing the biggest brands in beauty - from D&G, Prada and Dior to Lancome, Versace and Chanel - they’ve everything you need to add that touch of glamour and enhance your natural looks. Offering skincare, make-up and perfumes alongside delightful jewellery, watches and accessories - as well as skincare and body care products for men - Unineed are proud to be your go-to destination great looks and good health, and they offer worldwide shipping, too. When it comes to Skincare, we can often forget how important it is to care for and nurture our very own skin! Well, at Unineed you can find everything you need and more all in one place! Discover a wide range of Skincare products today at Unineed, boasting all your favourite and the most popular brands in the industry! Featuring the likes of Clinique, Clarins, Elizabeth Arden, Estee Lauder and so much more. At Unineed you can grab all these luxury brands at high street prices and why not add one of our Voucher Codes onto your order at the checkout for extra savings. Breathe some life back into your skin and start browsing the Skincare collection today. As most women know, you can never have too many handbags right? Of course not! And this is all the more reason to check out the fabulous range of designer bags & accessories over at Unineed today! With bags for both him and her such as Travel bags, wash bags, handbags, rucksacks, clutch bags, briefcases and so much more, there is something for everyone in the collection, whatever your style or preference. Featuring a wide range of luxury, premium brands including Lacoste, Michael Kors, Armani, Cavalli and Versace just to name a few; you can grab all these and more at low prices at Unineed! Find an array of discounted prices on the extensive range of products including Skincare, Makeup, Hair Care, Fragrance, Bags & Accessories! Unineed is your one-stop shop for all things beauty and features luxury brands and low discounted prices. You can save extra cash with one of our offers or voucher codes too so be sure to check right here for all the latest Unineed offers! Find more Delivery details on the Shipping and Delivery page. If you wish to make a return, you're guaranteed to a 14-day money back guarantee and your items must be returned within 14 days. Returns can only be accepted on products which are unopened, unused and still in their original packing. For hygiene reasons, Unineed cannot accept any pierced earrings or jewellery sets. For more returns details, see here. 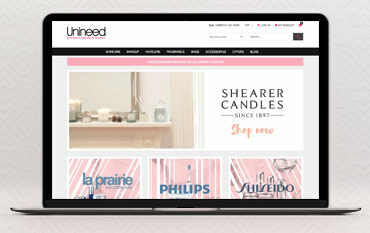 Unineed are an online fashion and beauty retailer offering products from over 250 brands featuring the likes of Clinique, Clarins, Elizabeth Arden, Estee Lauder, MAC, Michael Kors and so much more! With products ranging from skincare to make-up to bags & accessories, Unineed is your one stop shop for Premium Beauty & Fashion. Unineed pride themselves on quality products at quality prices, aiming to provide excellent customer service with their dedicated customer service team. Unineed’s stock is sourced from the most trusted suppliers to certify the excellence of all their products. With products for women and men as well as great special offers you can expect to find products for everyone at exceptionally good prices. Don't forget to browse all the latest Discount Codes right here and be sure to add them onto your order at the checkout for extra savings! Happy Shopping.